Traditions are an important part of holidays. And Christmas is no different. 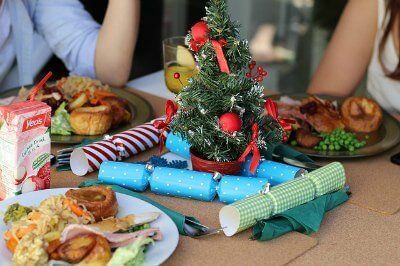 But when it comes to the Christmas dinner, you can be traditional and still add a bit of a twist to it to make it more fun — and possibly even more fun than the original. Here are just a few ideas to help you consider some twists to make it different. 1. Begin with the Turkey which is usually the #1 choice for most Christmas dinner tables. Typically, it is just a regular roasted turkey with stuffing or dressing. But back in 2016, Rachel Ray Every Day posted six flavor twists for the traditional turkey. These recipes are a great way to keep it traditional but with a little extra flavor that your family will love. 2. Stuffing / Dressing – Some call it dressing. Others call it stuffing. But either way, it is an important part of the Christmas dinner. There are those who make it with cornbread. Others who use dry bread. Sausage, oysters, apples and other fruits are just a few of the flavor combinations possible. Choose a recipe for one that isn’t traditional in your home or you might want to try this Holiday Turkey with Rice Stuffing recipe. 3. Go Vegan – It might seem impossible, but you can add a huge twist to your holiday meal simply by going vegan. Look no further than your Whole Foods Market website for great recipe ideas. If you don’t have a Whole Foods, you can still find ingredients at your local supermarket for the most part. If you don’t want to go totally vegan, some of these recipes can still add a twist to your traditional meal. 4. Holiday Ham – Many people enjoy a spiral-cut glazed ham on Christmas. It’s wonderful for that day but also for leftovers. There are many different recipes that are almost the same for this traditional dish. Why not shake it up with this Holiday Ham with a Texas Twist. With a glaze of cherry preserves, pecans, and Dijon mustard, you have a treat that will make that ham special. You don’t even have to live in Texas to enjoy it. 5. Pumpkin Pie – You may think you’ve seen all the variations of your beloved pumpkin pie, but how about no-bake pumpkin pie in a jar, pumpkin slab pie, pumpkin pie cinnamon rolls, pumpkin pie cheesecake bars, and the list goes on and on. Go to the Community Table website for recipes for 17 twists on traditional pumpkin pie. Be ready to get super-hungry. 6. Green Bean Casserole – Many people hate it, but many obviously love it because it seems like it’s part of every Christmas holiday meal. When I was growing up in the deep South, this casserole of green beans, mushroom soup, and fried onions was a tradition at every potluck and every Thanksgiving and Christmas. But here is the traditional recipe plus 17 different ways that you can add a unique twist to make it extra special. 7. Giblet Gravy – The traditional recipe is delicious but you can spice it up. You could stir in some sour cream to make it super-rich and creamy with a tangy kick. Another option is to spice it up by adding some hot sauce, or smoked paprika. 8. Christmas Pudding – Many people enjoy classic Christmas pudding at some point during the holidays. If you come from England then you know all about it. But Americans have discovered it as well. If you’ve never tried it, making the traditional recipe will be a great twist in itself, but if you have, consider these variations of Christmas pudding with a twist. Christmas is a tradition that has been with us for centuries but that doesn’t mean that you have to celebrate it the same way each year. Add some of these unique twists to the traditional turkey dinner or throw them all out and create your own traditions with a uniquely different Christmas dinner.